Are you ready to get your humidity levels under control today? If you only want a dehumidifier for a single room in your home, then it doesn’t make sense to purchase one of the best 70 pint dehumidifiers that is on the market today. A small dehumidifier would make more sense. There are numerous options available to you in this category, so this guide will take you through the evaluation steps necessary to help you find the best appliance at the best price. Small dehumidifiers still come with powerful features, but you must be selective in choosing the features you want. After you’ve determined your needs, you can compare and contrast the options available in this category to find the small dehumidifier that will help you to reach your indoor humidity levels. What Is a Small Dehumidifier and Why Do I Need One? Ever notice how the air in a specific room in your home can feel a bit sticky? This is because there is a high level of moisture in the air in that room. Whenever humidity levels exceed 50%, there is a chance that mold or mildew can develop. You might trigger allergy or asthma symptoms. You’ll sweat instantly, making your clothes stick to your skin in a very uncomfortable fashion. When you install the best small dehumidifier for your needs, you’ll begin to control this environment. Dehumidifiers use a fan to move air over coils that have been refrigerated, allowing the moisture to be collected within the machine before it is expelled back into your room. The end result is air that doesn’t feel like you walked outside on a summer day right before a thunderstorm is about it roll on through. Every dehumidifier works a little bit differently in this category. There are also different capacity levels as well. This is why the best reviews of small dehumidifier include technical specifications that you can compare. Focus on your needs, compare them to the performance that you’ll receive, and you will know that you’re selecting the right appliance for your home. You’ll find a number of quality features are now included in small dehumidifiers these days. In many ways, the small dehumidifiers are designed a lot like their larger capacity counterparts. Here are some of the features that we look at when reviewing small dehumidifiers and why we believe they are the most important to consider. Controls that are user-friendly. Many small dehumidifiers will include a humidistat so that you can set a specific humidity goal for your room. Some models include a temperature control as well. When controls are uncomplicated, it makes things easier when you need to control humidity levels. Automatic restart. Sometimes the power may go out. You might not have a generator available to provide backup power. With an automatic restart feature, your small dehumidifier will turn back on once the power returns so you don’t have to worry about resetting the machine. Frost sensors. Over time, the vapor that escapes the collection tank or drainage hose will eventually freeze into frost within the dehumidifier. The only way to prevent this is to defrost the machine. If there are frost sensors in place, the dehumidifier can turn off on its own or start a defrosting cycle so you aren’t wasting energy with a unit that isn’t taking moisture from your air any more. Every dehumidifier manufacturer today, from GE to Haier to LG and everything in-between, offers a number of features, sizing options, and price ranges to consumers. Each manufacturer has specific pros and cons to consider, but any of these appliances may be suitable for your home. This is why reviews and comparison-shopping must be done to get the best possible product today. Here’s an example of what we’re talking about: capacity. Some of the best small dehumidifiers only have a capacity of 4 ounces. Others have a capacity that may be as high as 15 pints, or 240 ounces. Pricing often scales upward as capacity levels increase, so think about your needs in this area before finalizing a purchasing decision. The size of dehumidifier you need for a room is dependent on the humidity levels it contains. If you have a room that consistently struggles with humidity levels that are extremely high, then you’ll need a dehumidifier with a large moisture capacity. On the other hand, if you just want humidity stability, a low capacity small dehumidifier could be very appropriate for your needs. Indoor temperatures are also important to consider when shopping for the best small dehumidifier. Many of the dehumidifiers in this category have minimal temperature controls, relying on what is present in your room. If you want to control humidity levels in a cool-temperature area, like a garage or cellar, then you’ll need to select a dehumidifier that can handle these temperatures. Otherwise your refrigerated coils may freeze up. What Are the Prices of the Best Small Dehumidifiers? The best small dehumidifiers on the market today are also some of the most affordable you can purchase when there is a need to control humidity levels. You can find high quality dehumidifiers for under $50 frequently, with some models even being priced below $20. If you want to reach the highest levels of capacity in this category, however, you’ll need to budget for an expense of $150-$200 depending on the features you want included. This small dehumidifier does a remarkably good job at giving you the moisture control you need. Effective in up to 1,600 cubic feet, you’ll be able to breathe air that feels fresher because it no longer has the weight of humidity hindering it. An air filter is also included with this design and it’s fully reusable thanks to its washable nature. Install this dehumidifier in your home or at the office and the extended air flow you receive thanks to the included ventilation fan will have you feeling better every day. Sometimes the best solution for your dehumidification needs is a desiccant option. This compact and effective design limits bacteria growth as it works to naturally limit humidity levels. Tilt protection is offered as a feature, as is an automatic full condensate tank warning, so you limit overuse and spills. We especially love the side tank design which makes maintaining this small dehumidifier a lot easier. 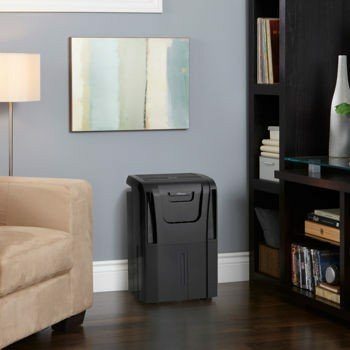 If you want to save energy and still create a comfortable indoor environment, we think you’ll love what this desiccant dehumidifier can provide your home. This whisper quiet dehumidifier is extremely compact, giving you the perfect dehumidifier for a small room in your home. It’s perfect for the bathroom, but would also work in a child’s room, small basements, or closets. It is CE and UL approved, offering you low energy consumption in exchange for a reservoir that holds 16 ounces of water at once. In one day, you can expect about 8 ounces of water collection in an environment that is 86F and 80% humidity according to the manufacturer specifications. A power adapter is included with purchase. This silica gel dehumidifier is the best small dehumidifier for many homes for a number of reasons. It’s extremely friendly around sensitive electronics, giving you protection for your computers, cameras, or lens-based tech that you may have in storage. Each product covers about 3 cubic feet of enclosed space, so it’s perfect for a cabinet or closet as well. The canisters don’t contain cobalt chloride either, but you will want to keep them out of reach of children. With no electricity required and effective moisture control, you’ll want to give this product a look. 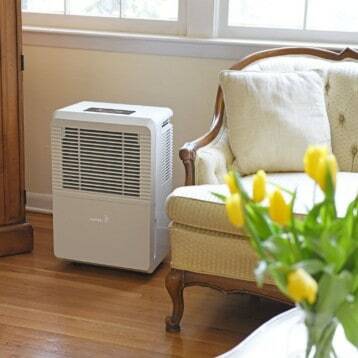 This dehumidifier focuses on providing your home with an environmentally friendly experience. High-tempered ABS materials are used to create the shell of this silica-gel dehumidifier. Use the included hook to hang this unit in a closet, workshop, or any other location you may need humidity control. It is 100% renewable, rated to operate for up to 10 years, and requires no wiring or batteries to give you results. At this price, you’ve got to take a look at what this small dehumidifier can do. The best small dehumidifiers will help you maintain humidity control effectively without taking up a lot of space. Find your affordable solution today and every breath will feel a little better.